Designer, goldsmith, silversmith and lapidary, Robert Borter has been creating one-of-a-kind wearable art in downtown Brattleboro for 19 years. At Borter's Jewelry Studio, 103 Main Street (2nd Floor), visitors can see one-of-a-kind classic jewelry made with 14 and 18 karat gold, sterling silver and the most exciting collection of rare and colorful gemstones in Brattleboro. Borter's workshop is filled with a plethora of jeweler's tools that may have changed little for over a century alongside modern tools offering state-of-the-art technology. Borter's early years in Arizona and New Mexico provided a solid background in traditional silversmithing and introduced him to the art of the lapidary (cutting and polishing gemstones). Following a move to the Pacific Northwest, Borter expanded his skills to include fine goldsmithing. In 1984, Borter returned east, to Vermont and began to further develop his gem-cutting skills, working for four years with one of America's finest lapidaries. During the middle 1980s, Borter's work was represented at "Artwear" in New York City, a premier gallery for wearable art, as well as numerous galleries in New York, Connecticut, Massachusetts, and Vermont. At this time, he and his wife Patricia co-owned and operated a jewelry store at Harmony Place in Brattleboro, featuring the work of numerous contemporary jewelry artists. His jewelry designs have been featured on the cover of Vogue magazine in Germany, in Lapidary Journal and in numerous juried art shows throughout the Northeast. Since 1997, Borter has been steadily developing his Main Street studio and showroom to better suit the needs of his many local and distant customers. In most ways, the ancient art of fashioning or "cutting" gems for use in jewelry has changed little over centuries. Chinese Turquoise, Lapis Lazuli, Amethyst, Garnet, Tourmaline, Opal and Agate are just some of the beautiful stones on Borter's palette. From all corners of the world, these stones and many more arrive at Borter's studio in their rough, natural and untreated form. Step by step, with a thorough understanding of materials and processes, he works the stones until their new form reveals their formerly hidden natural beauty. Age-old techniques such as lost wax casting and cold forging form the basis of Borter's work in precious metals. Acquired over 30 years from experts and from hands-on discovery, these skills have been finely honed and are part of the arsenal that Borter can call upon to achieve a desired goal. 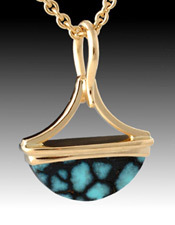 Innovative use of traditional methods is evident and makes his work stand apart from that of other contemporary jewelry designers. When watching him work at the jeweler's bench, it is clear that every aspect and detail of each piece is carefully considered before being meticulously finished by hand. Borter says, "Being able to adapt to a changing marketplace and changing technology is as much a part of my success as acquiring knowledge of traditional skills." He realized a few years ago the value a Web site could add to his business. In addition to showing work to a wider audience and communicating with customers about commissions, a Web site provides an online catalog of currently available work. Over a period of a few years, Borter taught himself the digital photography and Web design skills necessary to maintain an evolving and functioning Internet presence at www.BortersJewelry.com. "This type of up-to-date customer service is expected by my customers and appreciated." From an initial communication Borter can sketch ideas, photograph the sketches, e-mail them to the customer for approval and complete a project in a convenient and timely manner for customers near and far. Borter recalls a recent inquiry to his Web site resulting in a commissioned engagement ring. 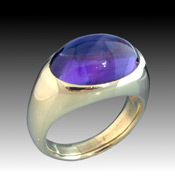 The customer searched the Web for custom jewelers and located half a dozen designers whose work appealed to him. When he narrowed the search to Borter, he was pleasantly surprised to discover his choice was only fifteen miles from his home. Having a Web site and doing the digital work has given Borter new perspectives on the design process. "I am constantly finding better ways to use this technology to improve my presentation to customers and my ability to design great jewelry. I have been experimenting with 3D design programs and CAD/CAM applications that are presently affecting the jewelry industry and will no doubt continue to do so in the future." "It is such a gratifying feeling when I witness someone slowly walking their eyes across my jewelry display, being drawn to a particular piece and deciding they can't go home without it. There have been occasions when someone asks to see a piece and, not wanting to put it down, it inevitably becomes their own. Possibly due to size, jewelry objects tend to be intimate and personal for many admirers." He continues, "A jewelry artist's work needs to relate to the human form, the human spirit, and the world we live in and become a part of everyday life to individuals and possibly to generations that follow. I have to say I am thankful for having found my destiny." Borter says his personal design challenge is to distill everything, eliminating that which doesn't add to the finished piece; negative space shares the stage with strong shapes and vivid color and a scale that relates to the human body, sometimes intimate and sometimes powerful. 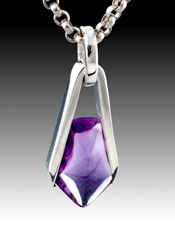 Simple, clean and elegant are words often used to describe Borter's jewelry. 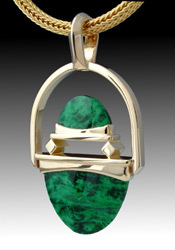 The gemstones are magnificent examples of the earth's treasure, shaped and polished to perfection. The gold and silver work is strong and well crafted. Together these fine materials transcend simple craft and become an original work of art in the hands of Brattleboro's Robert Borter.